Familiar with Raden Mas legend? One of the 'main character' was the formidable warrior named Raden Diar Dhurmakusomo Ki Aji Ningrat or known as the famous "DENDIAR". He is one of the General of Pangiran Agung Raden Kesumowijoyo, 2nd in throne of Kanjeng Ratu Kediri (Giri?). - Raden Kesumowijo and Raden Manosekoro were 2 sibling from different mother. - Then, Pangiran Agung (Raden Kesumowijoyo) married a dancer, "Mas Ayu". - Raden Manosekoro murdered "Mas Ayu" during the struggle and trying to burn the Keraton along with her newborn daughter - Raden Mas. - The hunting party of Pangeran Agung arrive at the scene and found out that his Keraton were burning. - He along with Raden Diar then run amoks through out the night killing Raden Manosekoro and his followers. No one left breathing. - He then swore by her blood "I shall forbid my feet, even the dust in my palms to touch the land of Giri"
His formidable fighter, Raden Diar and 6 his followers sworn to raze the land of Giri and its Kingdom until nothing living creatures shall live, but stopped by Pangeran Agung. Pangeran Agung makes Raden Diar swear to protect Kingdom of Giri during his absent. Then he left the land of Java, forever. 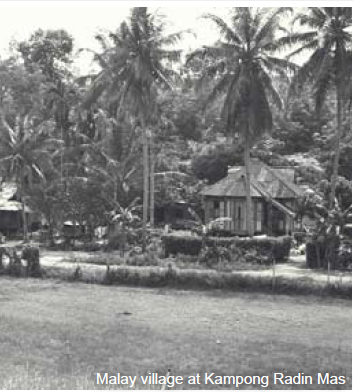 - Pangeran Agung then settling at Singapore as a peasant, at foot of Mount Faber (Bukit Larangan) with his daughter "Raden Mas" for 17 years after he left Kingdom of Giri. - In one occasion, Pangeran Agung trying to save her daughter from harassment perpetrated by members of Johore Royal Court. He is summoned to Istana and punished. - The same day, Raden Diar boarded his ship for search of supply. The event become a news of the day in the market and reached his ear. - He then shouted and leaping straight to the middle of the square with his Keris unsheathed. - He introduce his name, "Raden Diar" the War General of Kingdom of Giri.. the crowd stood silence, as the name itself has bring terror - when hearing neighbouring Kingdom of Karimun which he defeated in total destruction few years before. - Both of them shed tears, looking at the poor condition of Pangeran Agung, the formidable Raden Diar want to run amoks. - Again, he was stopped by Pangeran Agung for a 2nd time. Seeing such dramatic event, the Penguasa Singapore Sultan Abd. Jalil ordered to release the prisoner. They apologized for the misfortune as they not know that 'peasant' is actually the Crown Prince of Giri. Sometime later, Sultan Abd. Jalil arrange the marriage of his sister Tunku Khalijah with Pangeran Agung, as to joint 2 royal bloodlines, and to apologize for the mistreatment. The event was celebrated in Telok Blangah, attended by Raden Diar Dhumakusomo Ki Aji Ningrat with his 6 followers. 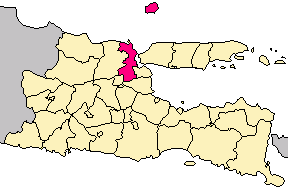 Seeing the problem has been mended, Raden Diar then left for Giri, as he still bound to his oath to protect Kingdom of Giri during the absent of Pangeran Agung. 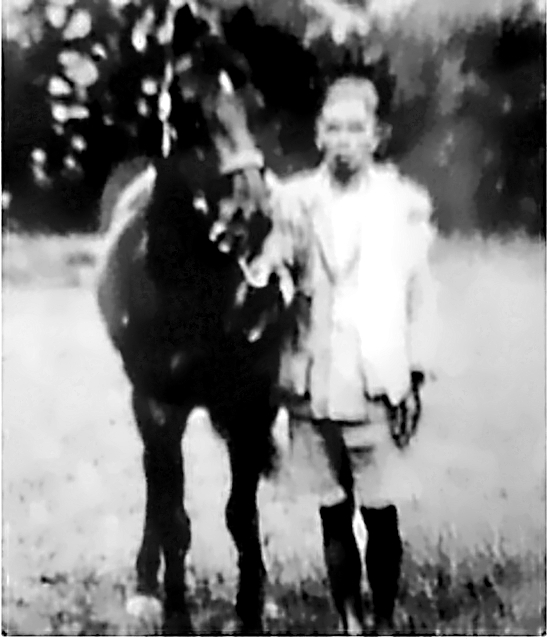 Pangeran Agung and Tunku Khalijah then bore a child named "Tunku Chik". Mas Ayu still a priority in the eyes of Pangeran Agung. And Mas Ayu has become a primadona in Malay archipelago for his beauty, and her royalty status. This grows jealousy of his wife Tunku Khalijah. While, Khalijah brother, Tunku Bagus were fall in love with Mas Ayu. Then one night, Tunku Bagus invited Pangeran Agung for dinner and drugged him. 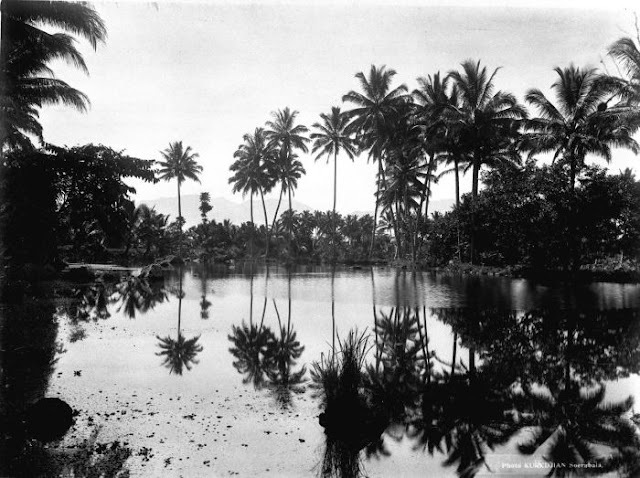 Pangeran Agung were sent to live at the well behind Istana. Then Mas Ayu were forced to marry Tunku Bagus. Few months later, a ship from Giri departed at Telok Blangah's port. Raden Diar were coming to visit his friend, Pangeran Agung. News reached the Royal Court of Telok Blangah with tremble. The reigning Sultan comes with excuse that Pangeran Agung has went 'bersuluk'. Tunku Chik (Pangeran Agung's son with Tunku Khalijah 6 years old) then said that his father was in the well behind Istana. This shocked the band of Giri's. Raden Diar then rushing to save him. Seeing the terrible horror to come, Tunku Bagus then ran to the well and trying to kill Pangeran Agung to avoid him telling the stories so that he could destroy the evidence. Seeing this, Mas Ayu rushed and block his father, the Keris then stabbed into her stomach. Raden Mas died immediately. Brokenhearted, Pangeran Agung then died with his daughter at his arm. Seeing such atrocity, 7 javanese warrior sheathed their Keris and ran amoks. Thousand died. The Kings and their household set sails away from the island. They can only watch the terror that Raden Diar brought from afar. Singapore was burning for 7 days and 7 nights. Yes. The victims of scorching wrath of Dendiar was buried nearby. 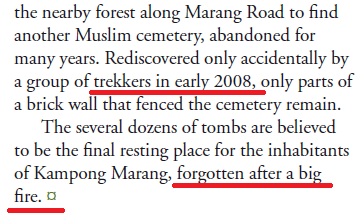 They only discovered this ancient tombs in 2008. Upon the advice by the elders, the Sultan sent Tunku Chik, son of the demised Pangeran Agung went ashore. He said to Raden Diar "Raden.... if you kill everybody, who going to take care of me?" Raden Diar stood still, then humbly kneel in front of Tunku Chik crying. He then later sworn oath, with blood in his hands that... "He.. Raden Diar Dhurmakusomo Ki Aji Ningrat,... shall serve and obey Tunku Chik and his bloodlines, like he serve Pangeran Agung, as sign of his never-ending loyalty to Pangeran Agung". Thus this marked the beginning of this curse..... Dendiar become immortal! Stamford Raffles, the Founder of Singapore. 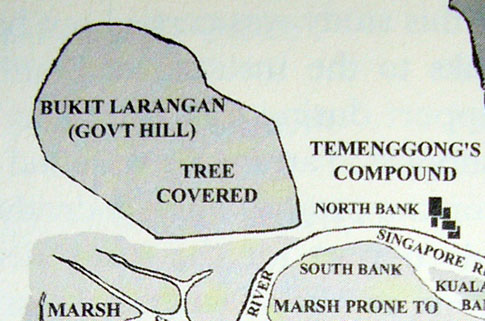 Upon the signing of the agreement with Temenggong, Stamford Raffles then ascend to "Forbidden Hill" or "Bukit Larangan". 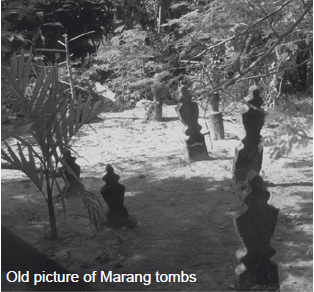 The legend, throughout the centuries said, that the hill was haunted by thousand corpse (continue in Untold History : Mount Faber and Thousand Corpses), screaming and drum beating could be listened from afar at night. No one would dare to enter it. But, as recorded in Anecdotal History of Singapore ; 'someone' advise the Temenggung, then later advise Stamford Raffles to fire 12 gunsalute at the peak of the hill.... which Stamford Raffles follows, thus lift the bloody curse.. and "Forbidden Hill" then habitable again. That 'someone' is Raden Diar. No record abount "Dendiar" found during his reign, except... Temenggong Daeng Ibrahim managed to put down the piracy at Malacca and Johore Straits in total annihilation with help from formidable 'fighter'.. probably Dendiar himself. Piracy was set to rest during his reign. Abu Bakar invested heavily in local politics. He directly involved in 3 wars.. the Jementah War, Civil War of Selangor.. and Bendahara Pahang's War. He earned favorable outcomes from Jementah and Selangor's war, but loosing Pahang's War -- but he managed to secure Pahang's land of Endau and Mersing, while Tioman was given back to Pahang. It is believed that he sent Raden Diar to help of that 2 wars - while Raden Diar not helping him during Pahang's war because 2 of them were came from the same family of Johor royalty of whome Raden Diar served ! 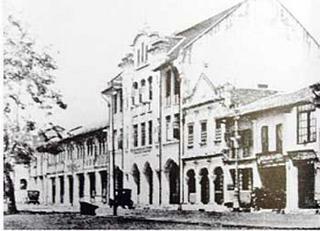 Few gigantic marbles and stones were brought from London for construction of the Palace, and were lift by local Malay - "Wong Ah Fook - Builder and Enterprenuer"
During Abu Bakar reign, he managed to retain Telok Blangah compound, Tyersall and few other places from British upon the advise from 'someone'. This person, 'teach' him to subdue the British officer in the most honorable manners. He managed to put down the threats from reputable Chinese Triad operated in Johore with the help of 'friend'. No bloody incidents happened during his reign unlike Singapore. The best recorded history Raden Diar was mentioned in "Clinton Morning Post" published in Scotland sometime in 1920's. 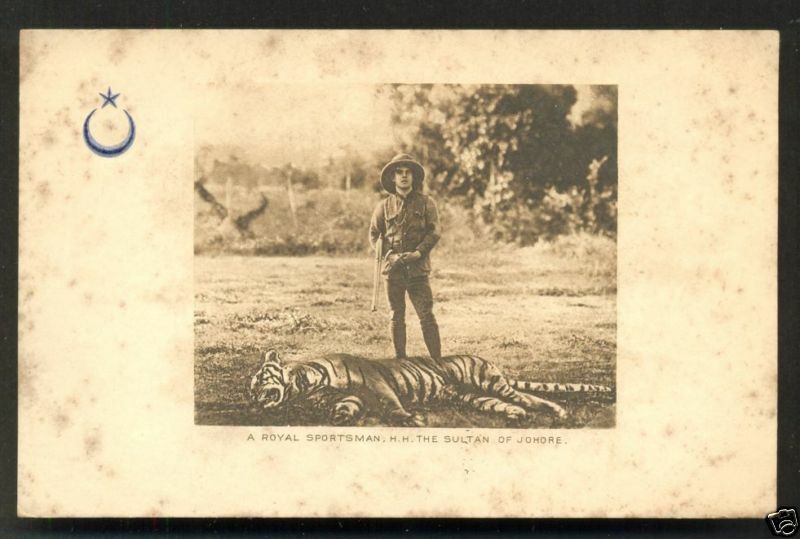 Sultan Ibrahim is known of his reputation as the most formidable hunter in history. He used to travel by foot when go for hunting the big games. One of his loyal company of the 'elderly of 50's'... = remember the story of Raden Diar going for hunting with Pangeran Agung??? Sultan Ibrahim were always success in finding his target within a day hunting, the tiger come to him, not the otherwise.. It is believed that Raden Diar were accompany him for hunting and call those beasty animals to show up. 1. When Istana Semayam was burning by retreating British Army, it is said that one elderly man was rushing back and forth try to put off the fire - using the "Gayung Upih".. that has many holes. One other legends says that, every evening, there will be one elderly men showering the plants and flowers at Taman Istana using the "Gayung Upih".. also had many holes, which could not holds any water. 2. HRH Ibrahim's resident at Bukit Serene, Istana Besar, and Bukit Timbalan (Tomb of Johor Royalty Bendahara Mutahin).. of which all the Japanese officer were stationed at, were not destroyed by Bombs dropped by British Army. 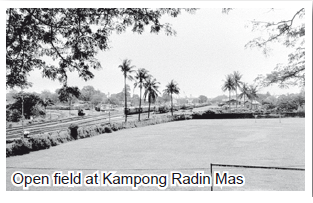 While, Istana Semayam which situated less than 100 metres from Istana Besar was destroyed by shelling. No other record found about Dendiar during his reign. Hong Kong's Bank Manager was irritating when he saw an elderly chap was squatting at the entrance of his Bank. He was later ask the Guard to chase the elderly chap out from his premise. But the Malay Guard did not dare to do as many strange story emerged during 1970's around the town about the mystery elderly chap. The Manager then himself chase the man out by throwing his Batik Bag to the street. The men left. Something unimaginable then happened, all monies inside his bank were turned to dry leaf and wood chips. He later reported the incident to Sultan Ismail, whom happened to be a major shareholder in Hong Kong Bank Berhad. Instead of having the truth tells, the Manager was bitchslapped by the Sultan and ordered him a public apologize. Happened to Tn. Hj. Anuar Hj. Abdul Jalil, real life author of the "Untold History : Dead Men Diary". In Friday afternoon sometimes in 1979, he took a cab to go back to Tiram from Johor Bahru old Bus Station. He shared tHE cab with one elderly chap. They were having their chats along the way back, about family, interests, hobby etc. The 'elderly chap' told him that his name was "Raden Diar Dhurmakusomo Ki Aji Ningrat".. at 1st, it did not struck him any alarming notice as the name was not familiar popularized. He said that he live in the 'old quarters' behind Istana Besar, quarter no. 13, beside the Barber Shop. He worked as Gardener at Istana Besar and he is on his 'holiday'. When the cab arrived at Tiram Taxi Stand, they exchange a gift, Tn. Hj. gave the men 1 ring, then the men trade him a black small Keris. The elderly chap then paid $10 fares to the driver for 2 passengers. Tn. Hj. Anuar then reached his pocket to return the $5 his portion to the elderly chap, the men was gone. Tn. Hj. Anuar then asked the cab driver "where did the old men go?".. The cab drive then replied "which old men?" "The one sitting next to me" murmurred by Tn. Hj. Anuar..
Tn. Hj. Anuar then received a strange answer from him "there was no old guy sitting next to you.. he was young, i though he is your son"
Tn. Hj. Anuar left dumbfounded. Then something strucked him......... "Raden Diar Dhurmakusomo Ki Aji Ningrat" were actually the famous "Dendiar"! He then rushed back to Istana Besar, forgetting his Friday prayers. The whole evening, from 1.00 pm to 6.00 pm, he walking through Taman Istana at Istana Besar to find an old quarters no. 13 mentioned by the elderly chap in the cab that afternoon.. and the Barber Shop were demolished in 1930's. Nothing has been found... until 1985. 6 years later, while finishing handmade Keris ordered by his friend from Gelang Patah. The man said that he unable to pay the price for the Keris work. Considering that the man come from afar, Tn. Hj. Anuar then offered him to trade something in return, instead of paying money. 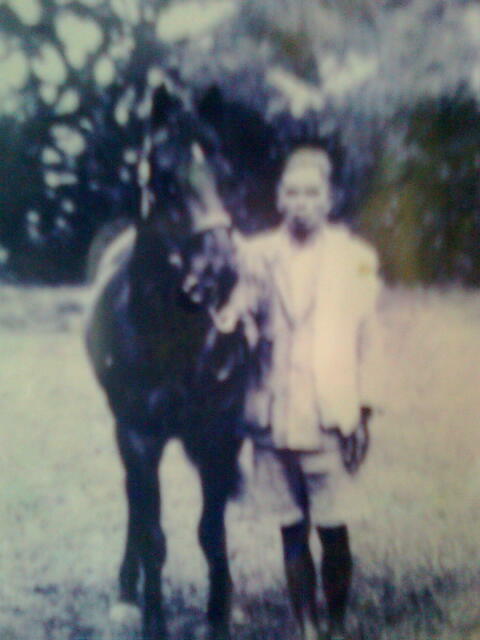 All he has just an old picture of Sultan Ibrahim in horse stable. Tn. Hj. said it enough for him. \Strikes by lightning, Tn. Hj. Anuar was amazed by the picture... showing that the 'old men' he meets in 1979 is actually in the picture which taken sometimes in 1920's. He seems never aged a day in 1979. Stil in his 50's . This original picture dated in 1920's still hang at his house in Ulu Tebrau, Ulu Tiram, along with small black Keris given by Raden Diar as gift while they were in the cab in 1979. Few other occurance was reported by Johor's local about the mystery elderly chap. Remember the story of Raden Diar's sworn oath = to protect "Tunku Chik" in 1600's ????? ?